This entry was posted in approximation algorithms, c++, computational complexity, integer programming and tagged coin-or. Bookmark the permalink. Reblogged this on Operations Research. Using your connected components, we can find a minimum number of moves to flood any component. Then, look at the components which are a maximum distance away. We might clear one of these components after the maximum distance number of moves, and need an additional move to clear each additional component. If all colors are not cleared, consider components that are maximum distance minus one moves away. Again, we may clear one of the uncleared colors making the maximum distance – 1 move, and we will eventually need another move for each additional uncleared color at that distance. We can keep backing up to earlier distances until we have accounted for every color being cleared. This lower bound is fairly reasonable. Using this bound and the heuristic of always making a move that clears a color when possible, we can find optimal moves for 14×14 board positions searching on the order of 10,000 boards. For a 14×14 board we may typically estimate a lower bound of 17 to 19 when the actual solution requires 19 to 23 moves. 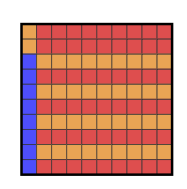 For example, for the board given in the Greedy Algorithm picture, the blue area can be reached in one move, as can the upper horizontal red stripe. All other areas can then be reached in two moves. There are two colors reachable in 2 moves, requiring at least 3 moves total; the 3rd color may be cleared on the 1st move. So, in this example, the lower bound is, in fact, the optimal number of moves. An initial lower bound of 16. 2,914 nodes to find a solution. Thanks for you comment. I understood that the most distant component represents a lower bound, but I’m having trouble to see why it’s true that we can increase this lower bound by coloring the remaining components. I’ll try to incorporate this lower bound in the algorithm. Did you implement these ideas to get the solution for the 14×14 board? Yes, I implemented the above ideas to solve 14×14. Define a “bubble” to be a group of connected cells all of the same color. We agree tat the maximum distance in which a bubble might be reachable is a lower bound. If there are multiple bubbles of different colors at that maximum distance, we can only clear one of those colors on the turn we move to the maximum distance. We need an additional turn to clear each remaining color. The four upper-right R cells are can be flooded in one move. The four lower-left B cells are also distance one away. The bubble of two oranges and the bubble of two reds are each distance two away. We can’t clear both of those colors on the second move, so we will need at least three moves to solve this board. If the next to last distance contains multiple colors that aren’t contained in the last distance, we need additional moves to clear these extra colors as well. It’s not that we’re “coloring the remaining components”. Rather, we are counting the colors that need to be cleared. When we are playing the game ourselves, near the end of the game, we frequently get to a point where one color is blocking many bubbles of other colors. 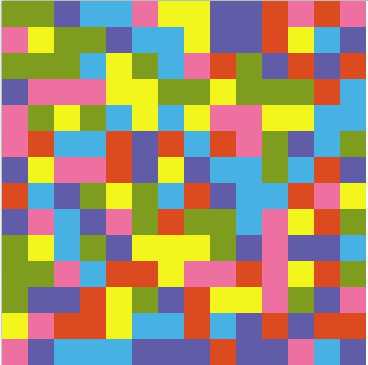 We flood with that color, and suddenly we have multiple colors that can each be removed in one move. Tonight I implemented your idea of screen capturing the board position and extracting a machine readable version of the flood-it board. Worked great, thanks. So I’m now working on solving a 21×21 board, which is going kinda slow. ;-) My python program doesn’t process very many nodes per second. So, I need a better estimate of the lower bound. When manually working through a board to find optimal solutions, it appears that sometimes a bubble can be in the shadow of another bubble of the same color. We may be able to use this to prove that a lower bound is too low and needs to be increased. The basic idea is, for each bubble, to pick the turn on which that bubble will be flooded. By forcing a certain color to be flooded on a certain turn, any other color reachable on that turn must wait to be flooded until the next turn. Using these constraints we can re-create the distance map. If the lower bound derived from the new distance map is worse than the lower bound we re trying to disprove, we cannot flood the bubble on the turn that we tried.